A funny racing game similar to the Mario Kart series. During the game, the players are racing through a fruit world and they use various power-ups. The game can be played in single-player and multiplayer modes. All-Star Fruit Racing is an arcade racing game similar to the Mario Kart series. It was developed by Italian studio 3DClouds which cooperated with the small publisher PQube. The game lacks realism. During the game, the players assume the role of drivers of unusual vehicles and they race in a fruit world. The developers created more than twenty wacky tracks, filled with jumps, sharp turns and boost fields. The tracks are assigned to five worlds that symbolize different seasons (summer, winter, spring, autumn) and special islands. The gameplay isn’t focused only on fast driving. Players must also use various power-ups. While driving, the players are collecting colorful orbs that symbolize juice from fruits like kiwi, cherries etc. These orbs fill special tanks. Depending on the situation and the tactics, the players can fill all tanks and then use them to perform a super attack, or they can deplete only a single tank to initiate less powerful attacks. The vehicles in the game can be customized. There are more than 32 thousand customization combinations available. 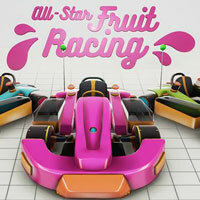 All-Star Fruit Racing lacks a classic story mode, but it features a campaign in which the players can participate in various championships to prove they are the best drivers. The game also features modes like Time Attack and Elimination. It is possible to create unique events by combining various competitions. The game supports multiplayer – locally it can be played by up to four players on a split screen and online it can be played by up to eight players simultaneously. All-Star Fruit Racing is a funny and colorful game. It lacks violence, so even kids can play it.